A strong, consistent identity is an important asset for our program, and the following guidelines are designed to help faculty and staff support that identity. A key goal in a strong identity program is to foster a consistent, positive image of CME in all of our communications efforts. All communications must adhere to our program standards for design, typography and color. The high visibility of these items directly impacts the program's identity and image. To better brand the school's CME program, a product line of promotional materials is being developed. These materials will be designed to be convenient for coordinators and include Microsoft Word templates, which save cost and time in the design and printing process. Save-the-Date announcements, brochures and other promotional materials must be submitted for approval by the CME office prior to circulation. For more information on the school's trademark and identity standards, please contact the Boonshoft School of Medicine Office of Marketing & Communications, at (937) 245-7610 or som_mc@wright.edu. Marketing your CME activity should be part of your planning from the beginning. Carefully analyze who your audience(s) might be and determine the best ways you can reach them. Clinical-based departments may be able to submit to the hospital newsletter and online calendar. Professional medical societies often have online calendars of specialty-specific CME. Electronic communications and reminders can be very effective. The university maintains an e-mail list for all faculty which any subscribed member may post to: Fac-L@wright.edu. 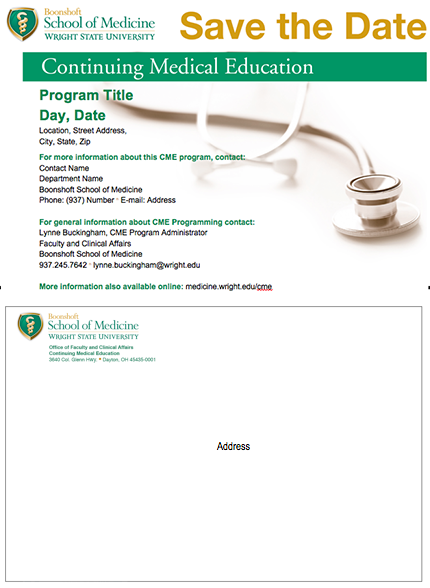 The Office of Faculty and Clinical Affairs maintains an e-mail list for Boonshoft School of Medicine faculty and will place your activity in the CME Calendar on this website. Well prepared brochures address the audience while meeting legal and ethical requirements. Use the guidelines below to develop text for your brochure. Identify objectives and intended audience. Clearly state the amount of CME credits offered - NOT that "credit has been applied for." Receive the approval of the CME Executive Committee. Include the Disabilities Statement and one of the Accreditation Statements below. "As an organization accredited for continuing medical education (CME), Wright State University Boonshoft School of Medicine fully complies with the legal requirements of the Americans with Disabilities Act rules and regulations. If any participant is in need of accommodations, written requests should be submitted at least one month in advance." "Wright State University (WSU) is accredited by the Accreditation Council for Continuing Medical Education (ACCME) to provide continuing medical education for physicians. WSU designated this [see above for learning format] for a maximum of [number of approved hours] AMA PRA Category 1 Credit(s)™. Physicians should claim only the credit commensurate with the extent of their participation in the activity." 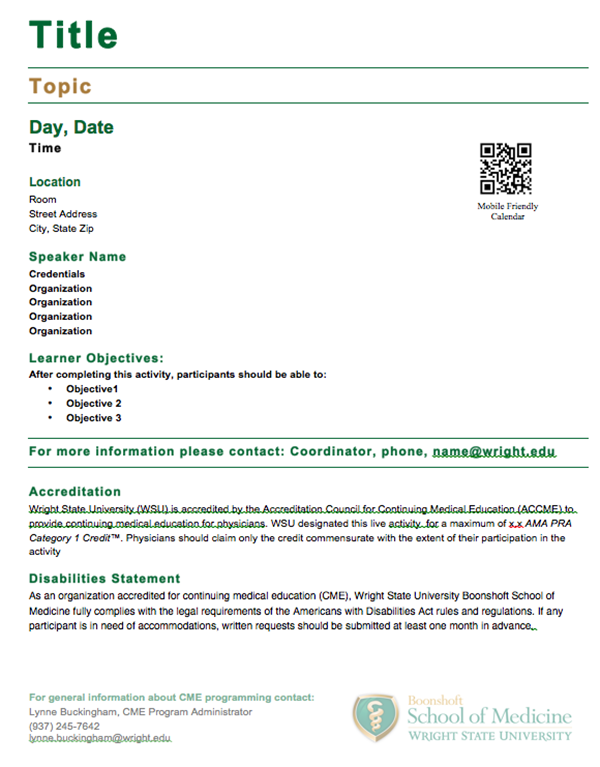 "This activity has been planned and implemented in accordance with the Essential Areas and Policies of the Accreditation Council for Continuing Medical Education (ACCME) through the joint providership of Wright State University (WSU) and [Non-accredited provider]. WSU designated this [see above for learning format] for a maximum of [number of approved hours] AMA PRA Category 1 Credit(s)™. Physicians should claim only the credit commensurate with the extent of their participation in the activity." After you have written the text for your brochure and at the time of applying for CME credit, contact Lynne Buckingham, CME program administrator, to have your brochure designed and printed. Using your text, she will work with the Boonshoft School of Medicine Office of Marketing and Communications to edit, design and prepare the brochure for printing at no charge to you. Marketing and Communications staff can work with WSU Printing Services to have your brochure printed and charged to your account or provide you with a print-ready PDF that you can take to your printer. WSU has contracted with a vendor to provide a secure way to collect registration fees. This service is integrated into the WSU Banner financial system. No credit card information is accessed by the department only registration details. Contact the CME program three months in advance of open registration to arrange for this service to be available. The program flyer can be distributed or used to post on bulletin boards. The flyer you develop should look like the image below and be ready at least one week before your CME activity. Download the Microsoft Word template to develop your flyer. The template provides fields where you can insert your specific information and incorporates the appropriate institutional identity. If you have difficulty completing this template, contact the Boonshoft School of Medicine Office of Marketing & Communications, at (937) 245-7610 or som_mc@wright.edu for technical assistance. The name tags you develop should look like the image below and be ready one week before your CME activity. Download the Microsoft Word Name Tag Template to develop your name tags, which are 3.0 inches by 4.0 inches, Avery 5392 Laser/Ink Jet Name Tags. The template provides fields where you can insert your CME activity title and incorporates the appropriate institutional identity. For small groups, you can easily just enter your names into the text fields on the tags; for larger groups, it is possible to create a data merge (see: below). If you have difficulty completing this template, contact the Boonshoft School of Medicine Office of Marketing & Communications at (937) 245-7610 or som_mc@wright.edu for technical assistance. To download the Name Tag Template, you will need to download the Sample Names List first because it is required for the template to work properly. 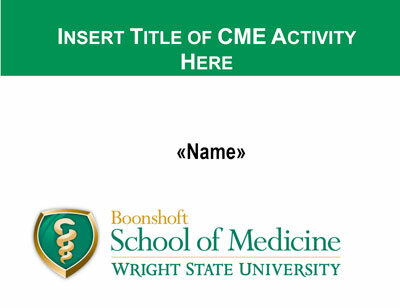 Once you have the time, place, and title confirmed, you can develop a "Save the Date" postcard resembling the image below to provide early notification of your upcoming CME. You should distribute your card about 12 weeks prior to your activity. Download the Microsoft Word templates to develop your card and send a completed copy to Lynne Buckingham, CME Program Administrator, to review. The template provides fields where you can insert your specific information and incorporates the appropriate institutional identity. If you have difficulty completing this template, contact the Boonshoft School of Medicine Office of Marketing & Communications, at (937) 245-7610 or som_mc@wright.edu for technical assistance.